Few Westerners will recognize in themselves the extraordinary drive in JD.com founder Richard Liu. His ambition led to his answering customer complaints personally in the early hours, and sending directives to his staff at midnight. The breathless approach worked for him – JD.com is East Asia’s homegrown answer to Amazon – but in The JD.com Story Liu warns others against it, expressing doubts on whether what the book calls ‘the Chinese model’ is sustainable. But nor does Liu rate what the text brands ‘the European model’ – using work and financial gain merely as a passport to a more leisure-filled existence. The sweet spot, says Liu, is somewhere in the middle – a mixture of work and play: making Jack (or Richard) neither a lazy nor a dull boy. Not that anyone could ever accuse Liu – or the book in which he stars – of being dull. Corporate histories often do fall into that trap – too much work, not enough play – but this one is different. We are treated to colourful accounts of late-night drinking sessions – Liu tells how he mastered the art of appearing sober at company events when extremely well served. 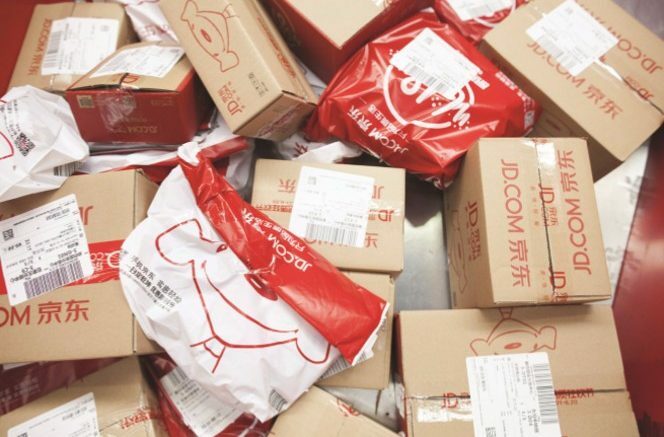 And there are entertaining anecdotes about Liu’s unorthodox methods – he spends a day every year delivering JD.com’s orders personally, using the opportunity to communicate face-to-face with customers, and to remember the hard work his staff do daily. The book’s idioms often sparkle: “Newborn calves don’t know enough to be afraid of tigers,” is a management message that endures: never underestimate – or underexploit – the fearlessness of the young. Once a fearless calf himself, Liu, along with a handful of his entrepreneurial contemporaries, played their part in transforming China. When the book’s author, Li Zhigang, was in his youth, the idea of a nationwide, flat-priced, mail order company seemed a distant dream. Even if those living outside the major cities were able to buy consumer goods, they paid a prohibitive premium for it. An electric rice cooker that sold for 99 yuan in metropolitan areas went for 139 yuan in village stores. Liu introduced nationwide logistics, bulk ordering and ultra-aggressive pricing to render this vast land smaller. The JD.com Story reflects the story of China itself – the growth from commercial backwater to global superpower within the space of a few decades. A nation of miracles requires miracle-workers, and the book suggests Liu is one of them: a potent confection of boundless energy, otherworldly determination – and a very human sense of fun and gregariousness. If Liu is the star of the piece, alcohol is the leading lady – the drinking culture in the early years of JD.com is documented unashamedly. When the company was getting off the ground, employees would work late into the evening several nights a week, subsisting on pancakes or noodles. Liu sometimes invited them out to dinner instead, so they could enjoy better food, and he could listen to their ideas. The meals were well fuelled. “The drinking culture at JD was like no other,” writes Li Zhigang. “It was about courage. You had to have the guts to drink like a fish with the others even if a glass of beer was enough to knock you out.” The pressure was heightened because Liu was consistently the last man standing – and the first to morning-after meetings despite consuming a skinful the night before. While the book credits the drinks parties as creating an atmosphere of openness and innovation – alcohol oiling the wheels – things are different today. JD’s concerns for its employees’ health have, the author suggests, turned off the beer tap. The boozy evenings might now be a note of history, yet Liu’s world view – that ideas should be cultivated from a company’s employees – persists. Once a reluctant signatory to the modern-day management ideas of forward-thinkers like Drucker, Liu has come to embrace them. His epiphany came when rereading some of Drucker’s texts and realizing that the great leadership guru was right to preach that no single individual could manage a major company, and that the formation of a powerful management team was crucial. Liu, through whom everything once flowed, was heard telling the chief executive of subsidiary JD Mall, “This is not my business. You can make your own decisions. Don’t ask me.” In truth the JD founder was regularly tempted to take back control, but he always stopped himself. He learned to devolve power. This can’t have been easy. If Liu’s is a story of a breathless adventurer, genial drinking buddy and sponge-like ideas gatherer, it is also the biography of a strict master and commander. He could be unsympathetic even – and especially – to his loved ones. The tale of his relationship with his young cousin Wu Jie reads more like that of an elder brother into whose care his younger sibling had been entrusted; of a parent with no experience of parenting. Wu, who was raised with Liu in their grandmother’s home, was unable to count to ten when he started school. Liu withheld his young cousin’s evening meals until he learned. Years later, when Wu played truant to learn martial arts, Liu made a special trip back from Beijing to reprimand him. Wu was defiant – so Liu slapped him. When they were both in adulthood, Liu told him to be loyal to the Chinese civil service despite Wu’s testimony that he was bored and underpaid. Only when his relative had put in three years’ service did he win Liu’s blessing to leave. This tough, quasi-paternalistic role was reflected in Liu’s work life. Some of the accounts of his exchanges with employees might seem blunt to European audiences – Liu would approach executives and ask them the price of an item, if they couldn’t recall instantly he’d ask them what they did all day – but this is probably a consequence of cultural differences between China and the West. Liu is well aware of that divide, and cites an English baker he once visited as emblematic of it. Everyday the baker produces hundreds of loaves. But if it runs out – even if there are many more potential customers in the queue – it simply shuts its doors and announces that the bread has sold out for the day. “If he knows he can sell ten loaves of bread a day, a Chinese person won’t sleep if he only sells nine,” Liu is quoted as saying. “He’ll try to sell 11 tomorrow.” Liu is doubtful that the Chinese economic miracle would ever have happened were Chinese bakers as relaxed as some Englishmen are with baking less bread than they can sell. Between The JD.com Story’s cultural insights lie thorough accounts of the company’s rise to global e-commerce leader. Much of the technical detail of the challenges faced by those in charge of digital projects may prove too esoteric for the casual reader, yet they are an important element in a book that strives as hard to be comprehensive as it does to be entertaining. Its depth of information ought not discourage those who seek a window into the Chinese miracle. This is a close-quarters tale of one man’s struggle to make hay as a whole nation harvests. It is as much compelling biography as keynote corporate history.